Opening at a concentration camp in Nazi Germany, X-Men (2000) initiated an exploration of how hatred and fear in the past echoes today. X-Men: Days of Future Past takes an opposite approach, opening in a not-too-distant future where humans and mutants alike are hunted by robots called Sentinels, an apocalyptic representation of the scale to which prejudice can mutate if not curtailed. A last ditch effort to avert this future sees immortal Wolverine’s (Hugh Jackman) consciousness being sent back into his past body. In sending Wolverine back to 1973, the film uses mutants as a thermometer to take the temperature of America as it pulls out of the Vietnam War. Disillusioned by the actions of his country and deaths of his people, Charles Xavier (James McAvoy) plunges his school and himself into disrepair. The drug that restores feeling to his legs supresses his telepathic powers, while alcohol dulls his mind further. Like a soldier disabled in battle he must accept his physical handicap to escape psychological self-imprisonment. Meanwhile, the American government are desperate to regain global authority by dealing with the “mutant threat” more smoothly than they did the war. 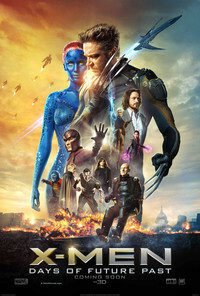 While continuing the franchise’s metaphorical exploration of history, Days of Future Past pieces together its own timeline, connecting dots between previous X-Men films set in different eras. This occurs through rationalising small inconsistencies between films (such as Beast’s [Nicholas Hoult] disappearing and reappearing blue fur) - although some larger ones are ignored - and setting characters on course for their destinies. There’s a trend with X-Men films that the more mutants featured, the narrower the group of characters who significantly develop becomes. Days of Future Past boasts the biggest ensemble yet, but focuses on the core from X-Men: First Class (2011): Xavier, Magneto (Michael Fassbender) and Mystique (Jennifer Lawrence). Although Wolverine is central, this future incarnation has reached the end of his arc by overcoming his animalistic tendencies, so functions only to steer Xavier back on track. Wolverine’s lack of rebelliousness is made up for by Xavier stepping into the role of bad boy, being hairier and swearier than Wolverine. In early scenes, at Xavier’s most apathetic, McAvoy seems to be having nearly as much fun unhinging himself as he did in Filth (2013), and the pleasure is shared by the audience. While Xavier’s is the central arc, Magneto and Mystique drift around villainous paths. As much as watching Fassbender strain to manipulate metal structures, and Lawrence dupe people with her charms, is never boring, this re-treads familiar ground. Mutants getting their cinematic debut are sadly not granted much development, but are established economically through demonstrations of powers. The scenes displaying Quicksilver’s (Evan Peters) superhuman speed abound with gags that convey his cheek as he whizzes around repositioning people and objects to undermine their authority. Elsewhere, the opening parades familiar X-Men and new faces in a spectacularly choreographed battle in which their powers are utilised in tandem, with Blink (Bingbing Fan) opening portals to transport teammates to Sentinels’ blind spots. Combining powers to create a team that is greater than the sum of its parts is a mark of some of the best X-Men stories, and in this sequence establishes a tight bond between mutants who are perfectly in sync with one another. The realisation of new characters’ powers distinguishes their basic traits and provides visual splendour, if not much depth, while the central characters’ interactions, although recycling familiar pleasures, complement a socio-political backdrop not previously visited by the film series. Days of Future Past may not revolutionise the X-Men’s adventures, but plays out the dynamics between characters and intersections with human history that make the franchise so entertaining. This review was published on May 26, 2014.